This week I’ve been trying to make all easy recipes that can be thrown together really fast on a weeknight. My husband also asked for “simple food” this week. Just we’ve been eating out so much and it just feels good to have nice light food! I had recently picked up some bottle gourd at our Indian market. Also called calabash, lauki (Hindi), and long melon, bottle gourd is a little like the summer squashes (zucchini, crookneck, etc. ), but a little more hearty and firm, yet not quite as hearty as your winter squashes (such as pumpkin). 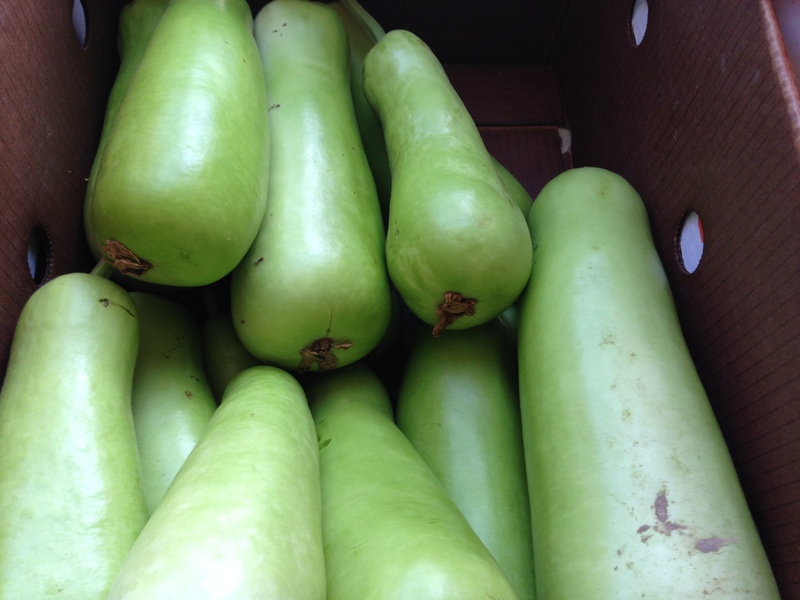 They often have bottle gourd at our Indian market. I think zucchini would be a fine substitute, but if using, the zucchini will cook faster and should be added later in the cooking process. I was thinking to make bottle gourd subji and googled to see if there was anything else simple to make with bottle gourd. 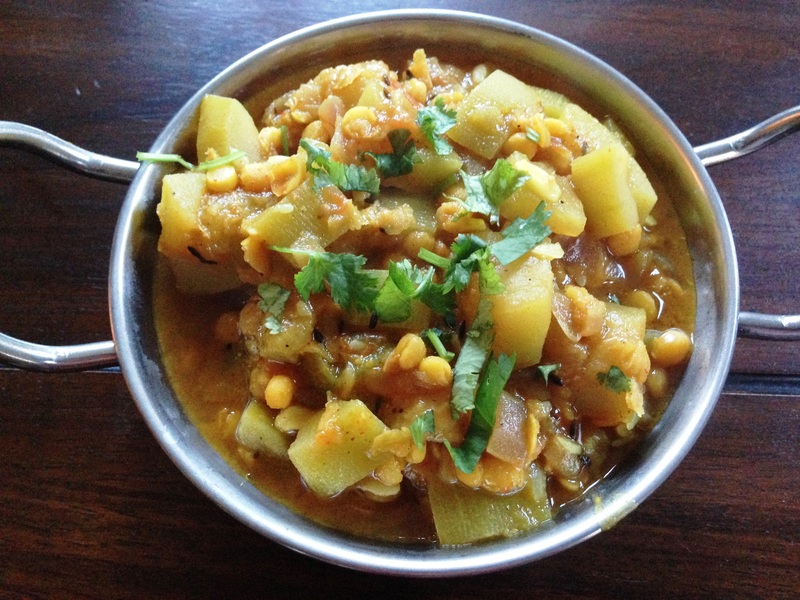 I found so many recipes for bottle gourd with chana dal which sounded perfect and more substantial as a one pot meal. I looked at quite a few recipes, but came up with my own version based on our tastes. It seriously only took about 20 minutes plus the time it took to soak the chana dal. We had this curry with small thin rotis and yogurt. Enjoy! Soak the chana dal for about an hour. We are soaking since the bottle gourd takes less time to cook than unsoaked chana dal and we want to cook everything together at once. In a pressure cooker, add oil and toast the cumin seeds until toasty and fragrant. Add the hing and let it sizzle, then add the onions, tomatoes, turmeric, chili powder, coriander powder, and garam masala, and cook for a couple of minutes. Add the bottle gourd and about 1 1/2 cups water. Cover and heat the pressure cooker on high until first whistle, then lower the heat to medium and cook for about 10 minutes. Put cooker under sink with cool running water to let out the steam and then carefully open. Put back on the stove. Heat kokum with a little water in the microwave then pour the water into the curry (or squeeze in the lemon). Salt to taste and sprinkle with cilantro.